J L Phillips Renewable Energy Ltd are Installers of Ground Source Heat Pumps, Air Source Heat Pumps & Biomass Boilers for both Commercial and Domestic Markets across the East Midlands. A Biomass Boiler is a highly efficient wood fuelled System. 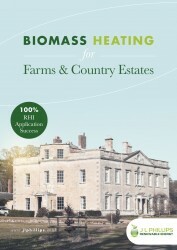 The Biomass System burns wood pellets, chips or logs to power central heating and hot water boilers. Please see our ESCo Finance Options for more information on funding a Biomass Boiler. 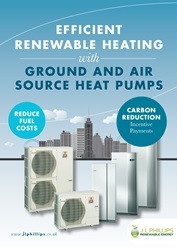 Ground Source Heat Pumps use pipes which are buried in the garden to extract heat from the ground. An Air Source Heat Pump is a device that harvests renewable energy from the sun which is stored in the ambient air around your property. Both can be used as a renewable energy source to heat your home or business. 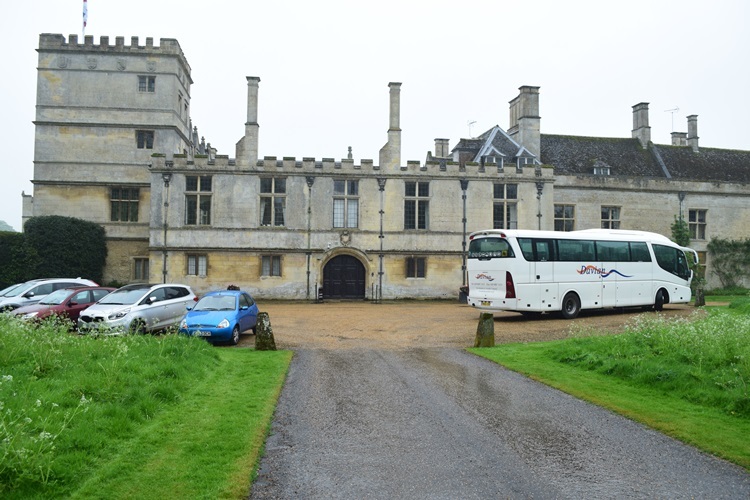 The land agent was looking at reducing the heating costs for the Hall, tenanted buildings and offices, as well as providing an uplift in the heating capacity due to the limited size of the existing gas main. 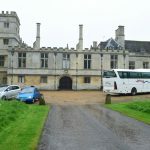 As the estate had the capability of producing its own woodchip a 350kW Herz Firematic wood chip boiler with a 5,000ltr buffer was specified to provide the heat, with a back-up gas boiler connected to the buffer and metered for ineligible incentivised heat production. A plant room was constructed within an existing farm building, with a new wood chip store constructed to the side of it. 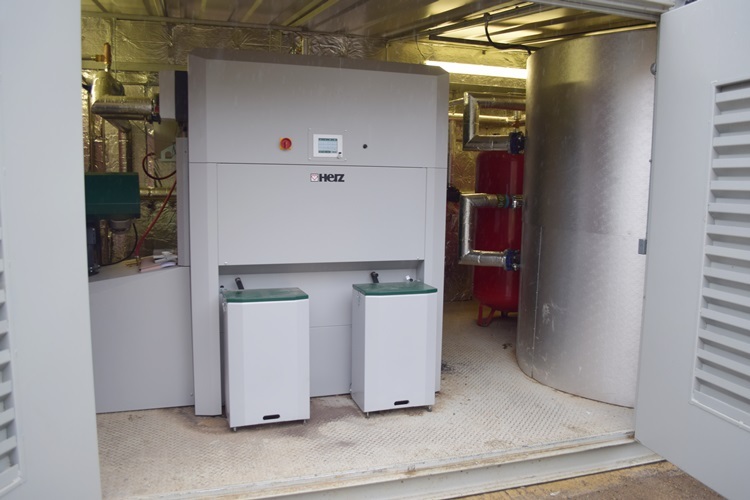 A district heat main was installed to carry the heat between the buildings, with a variable speed, temperature controlled shunt pump providing the heating control to each of the buildings. J L Phillips designed, specified and installed the project within criteria set out by the client, the boiler is now providing heat to all buildings with the back-up boiler automatically engaging during maintenance, down time and wood chip fills. 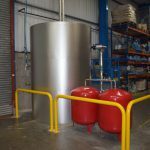 The customer required an alternative heating system for manufacturing process heat and space heating at their factory near Kirmington. 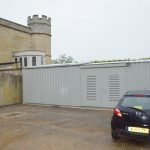 It was essential that a stable heat source was provided, so a back-up LPG boiler was installed to be called upon in the event of biomass boiler down time. 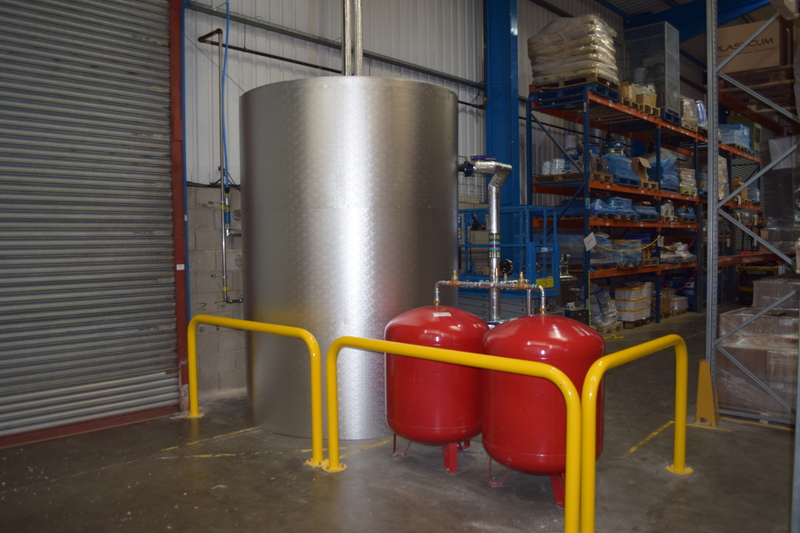 With future development in mind we advised the installation of a 301kW Herz Firematic with an 8,000ltr buffer running at a high 85-degree temperature to suit the manufacturing processes. 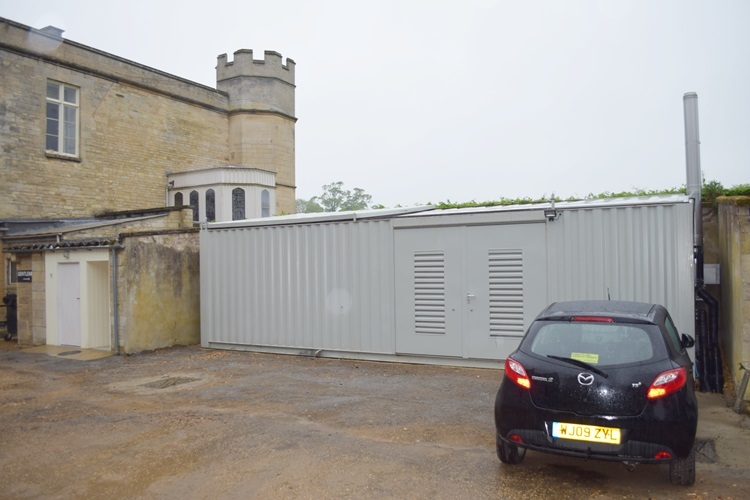 To ensure that project timelines were achieved and a minimum of disruption occurred, the biomass and LPG boiler plant room was built within a purpose made container off site at our manufacturing area. 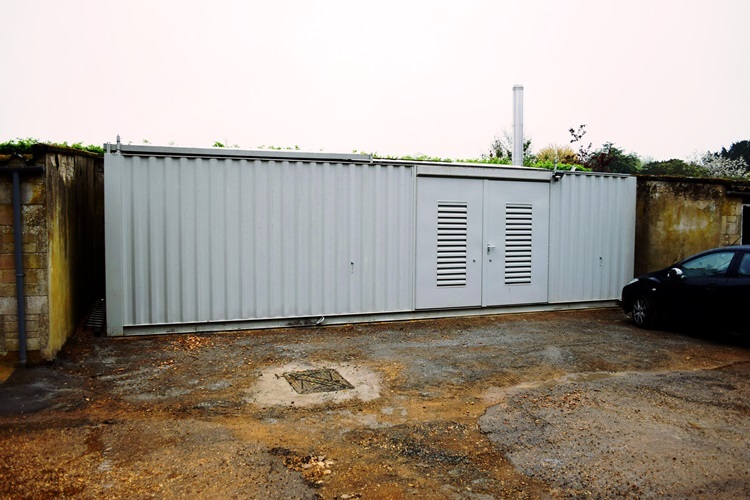 The pellet store was supplied by Collinson days before the biomass container, with the connections and commissioning taking just 7 days to complete. 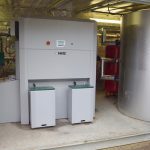 This particular project went very smoothly, as is often the case when a plant room is manufactured at our base in Newark, then delivered ready for connection to pre-prepared heating systems. 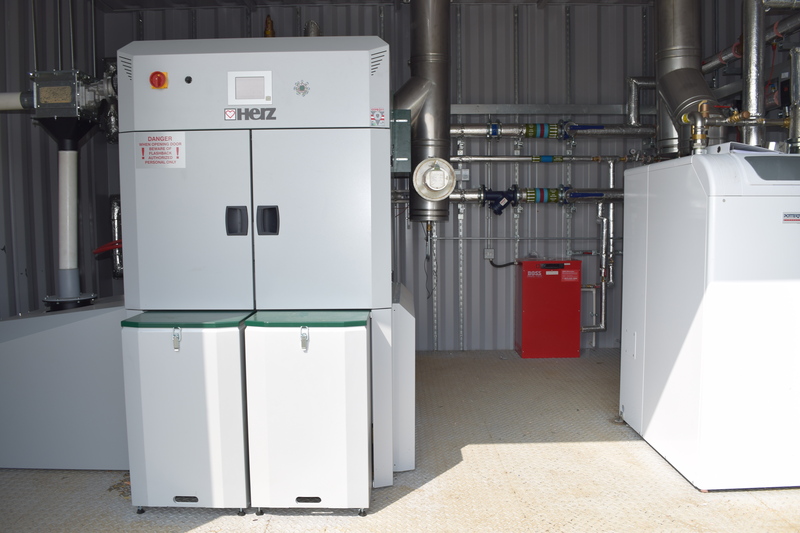 J L Phillips have the capability to manufacture biomass containerized systems up to 999kW’s in size, with built in buffering and in some cases, built in wood chip or wood pellet stores. 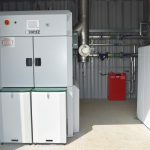 The customer required a large biomass heating system to provide heating for two large tenanted flats and a single, small, one bed flat on his farm near Caenby Corner in Lincolnshire. 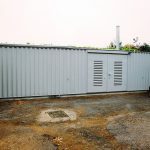 With the additional capacity, a district heating main was run from the boiler buffer tank to provide heating to a workshop and then on to the dairy wash down unit. The flats were originally heated by electric storage heaters, these were removed and a full radiator wet system was installed by J L Phillips Renewable Energy as part of the project. Wood chip was the main fuel source so the boiler was set up to accept woodchip supplied by the customer from his own stock. A pellet system was also installed to enable the use of pellets if the need arose. Each of the flats were metered to enable the tenants to monitor their heating usage and for RHI requirements. 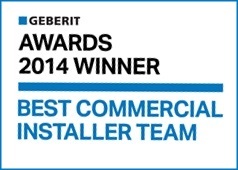 The workshop heating and the dairy water heating was also metered for RHI and Ofgem requirements. The installation of the boiler and buffer tank along with heat meters and controls to each area took just two weeks to install, with the radiator system taking a further two weeks. Now up and running, the feedback from the tenants is very positive, where once they were always trying to cut down on their heating, they now have an excellent efficient and cost effective heating system which heats their old Victorian building up to levels they have never before achieved. With an estimated heating demand of 125,000kWh per year, the customer will benefit from £7,489.80 in RHI payments per year for 20 years rising each year with RPI, plus a significant £8,750.00 saving in the cost of the displaced fuel oil and direct electric heating. Following the success of this installation, the customer has invited J L Phillips to assess and evaluate further projects on his Farm and other properties.